Giving back to the community is an important part of addiction recovery. Why Giving Back to the Community is Important. Harbor Hall. Recovery is about new opportunities, to discover one’s true potential. Residents at Harbor Hall often have questions concerning how to connect, fit-in and contribute to self and others. 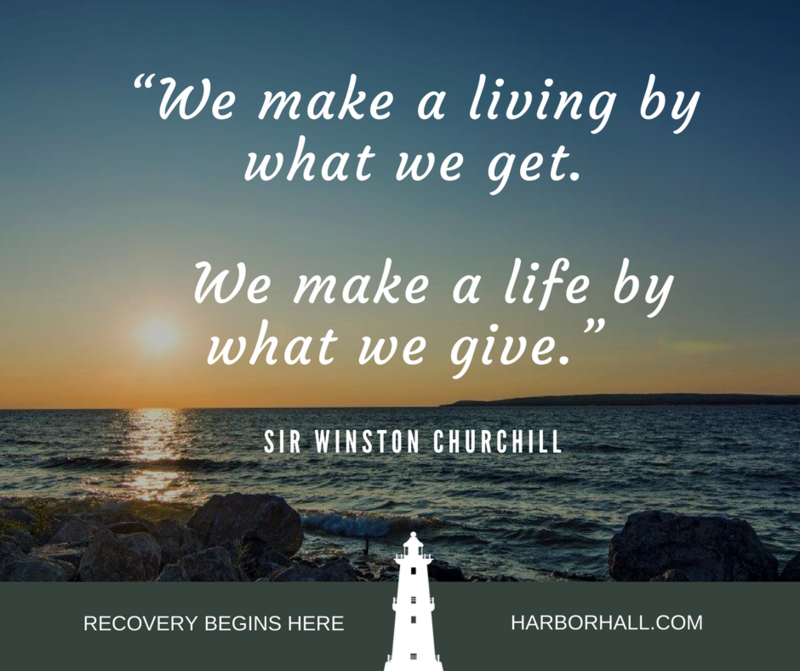 Part of the recovery program at harbor Hall is to provide opportunities to become involved in some manner. Being involved may include doing tasks such as house chores, volunteering in the community or seeking paid work. Through our treatment program, the residents gain a sense of pride, self-worth and accountability that may have been lost in active addiction. Our clients learn that they DO have something to contribute and that their contributions matter. Learning this and engaging in the community is all part of effectively managing one’s life in recovery. The residents of Harbor Hall have been actively involved in the local community for as long as I have been at Harbor Hall, over 18 years. They are taught that service and servant-hood are key ingredients in living a life in recovery and obtaining sobriety. Two times a week, helping with the heavy lifting and moving of donated items. Two times a week working in the resale shop and bell ringing over the holidays. Set up and tear down for the event. Spring and fall clean-up and maple syrup cooking. Speaking events at schools in Petoskey and Charlevoix. Volunteers for a variety of events like decorating downtown Petoskey for the Fall Harvest Festival. Set up for several local AA/NA meetings in Petoskey. Provide a great car wash every week during the warm months. Maintain the Harbor Hall campus in pristine condition. Most people in active addiction are takers. They are self-centered and ego driven. The actions above are all selfless, and help the recovery process by building a sense of community, self-worth, humility and recovery capitol. It is critical that people in early recovery learn it is very important to serve their community. The person in recovery greatly benefits from serving the community and individuals, as service brings about a new humbleness. 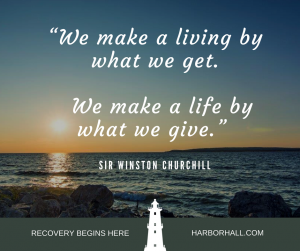 The action of giving brings about positive thinking and feeling for everyone, but most importantly for the person in recovery. Thoughts and feelings that were once driven by egos and self-centered behavior, are replaced with a positive sense of self, the ability to care for others, and the desire to serve. I believe that the benefit to the community is apparent to each of the above actions. Thank you to all who have participated in these events and for your support of our mission.